Looking for a job abroad might seem like a daunting task, and it's certainly life changing. If you are committed to working abroad or even moving permanently it is very rewarding. The key is to have a good idea of your goals and then prepare thoroughly before beginning your international job search. 1. Prepare – What job abroad and where? Firstly, know your own skills, if you have qualified in a specific field or have a stable career history this will be easier for you. If you are a graduate of a broader topic or have experience that suits a number of roles or industries have a good brainstorm of the kind of jobs you are looking for and at what level or salary expectation. Secondly, know where you do and don’t want to work abroad. If your goal is to move to one country great, if not list your options. Research thoroughly your chosen destination/s making sure they suit you well and are viable for you. Think long term too – what are the immigration routes if you want to stay permanently. Most importantly investigate visa requirements for every country – are you eligible and is the duration right for you. 2. Prepare – Update your resume/CV and social media channels. Before you begin applying for those international jobs, ensure your resume or CV is completely up to date. Check what the etiquette for CV’s is in the countries you are applying for – how does work history need to be laid out? Should you have a photograph? Do you need to detail correct references? Once your CV/Resume is complete ensure your social media profiles match. Update or create your LinkedIn profile. Remember that today’s recruiters will often check you out on Facebook, Twitter and other platforms too…just to see what kind of person you are! You may not even know they have. It’s worth checking the image you portray on the internet is someone employers will want to hire. When you are applying for jobs abroad you will need to introduce yourself properly. Explain why you want to work in that country, what you can offer, as well as why you want the job. Detail your visa requirements, illustrate if you can easily obtain a visa or honestly explain what an employer might need to do to hire you. It’s better, to be honest upfront rather than beginning a process that is not viable for either party. Onto hunting for those overseas jobs. Research the job boards that are most popular in the country you are looking at. Also look into to specialist industry job boards. Register with, and search, as many as you need to and make sure when you apply for a job you put 100% effort into each application. Specialist global recruiters can be incredibly helpful if you are looking to work abroad. They are most likely to have clients on their books who have already hired foreign workers, are familiar with the process and who want to hire foreign workers. A specialist agency can also help you, the applicant, with advice on the country, the employer, the visa process and assist step by step for the interview process. Don’t rely on job boards and agencies. Especially if you have a niche specialism. Research and find companies who you want to work for and who will most likely hire you. If a company is not advertising, try them with a speculative approach, introduce yourself and send your CV. You just never know. 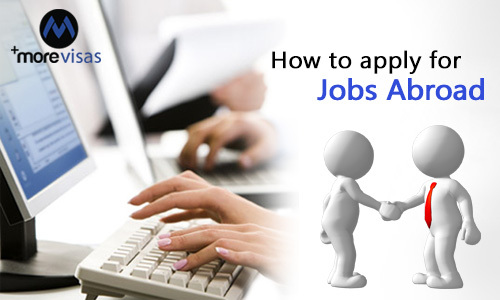 Applying for overseas jobs is no different to applying for jobs anywhere. Keep a track of the jobs you apply for, mark those of most interest. If you don’t hear back, enquire as to the status of your application and why you might not have been considered. Do this politely, a tenacious individual is a valuable employee – you might convince an employer you should be considered. If you are rejected listen to why and if you can learn from it for future applications.